Machining operation involves chip formation. We can see three common types of chips formed from a single point tool. The type of chip formed highly depends upon the tool geometry, the material of the workpiece to be machined and machining environment. The coefficient of friction between the cutting tool and surface of workpiece also affects the chips formation process. Below you will find the description of three main types. Uniform plastic deformation of the metal by the cutting tool is the main reason for the continuous chips. 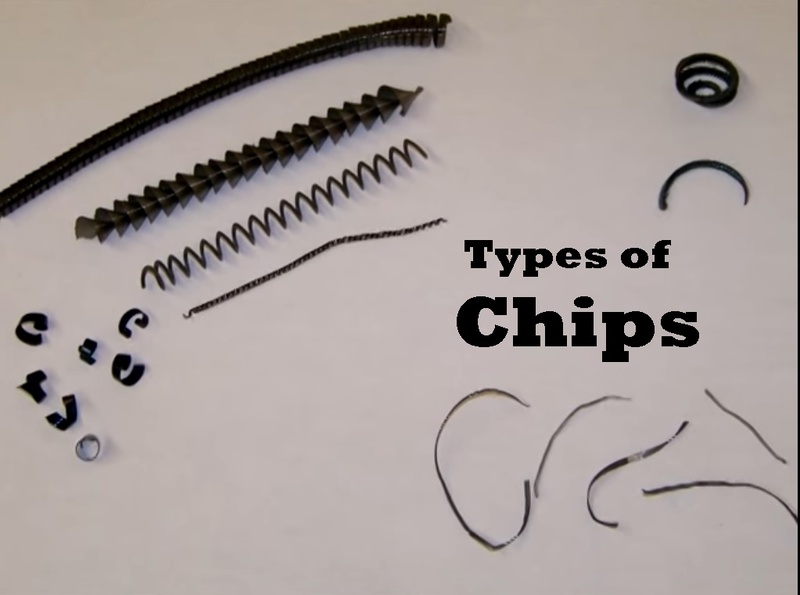 The shape of the chips will be a continuous spiral shape or a long string. The ductile material has the property of forming continuous chips. Other factors that satisfy the condition are low feed rate, high speed and low coefficient of friction. The formed chips are difficult to get rid of and can damage the surface of the workpiece if comes in contact with it. To prevent this case, a chip breaker is applied to cut them. This is similar to the above type but it is not smooth. A built-up edge is formed at the face of the cutting tool. The high value of friction and temperature is the main reason for the formation of the built-up edge. Low rake angle, slow speed, and ineffective lubricant favor this type of chip. It results in the low surface finish. The tool wears comparatively faster. Thus lowering the life of the tool. Unstable cutting forces which result in high vibrations. In this type segment of chips are formed. The brittle material when machined at low speed produces segmental chips. Lower back rake angle of the tool and impurities in the material to be machined favors discontinuous chips. It is desirable in machining brittle metal as it results in the good surface finish and increases cutting tool life.